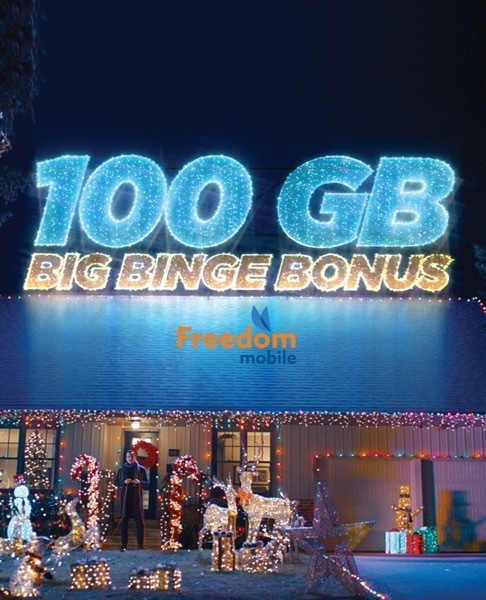 Dubbed their 100GB Big Binge bonus, Freedom Mobile says “Canadians can stream without fear of expensive overage charges” with this bonus data, which is included with all Big Gig plans starting at $60 per month. The 100 GB LTE bonus data is on top of the included data in your Big Gig plan. Freedom Mobile says the bonus data can be used anytime—with no restrictions. Once a user goes over their included data allotment on their Big Gig plan, the 100GB LTE data bonus kicks in, and customers can use as little or as much as they want. “We’re continuing to find new and better ways to give consumers what they want, and that includes giving Canadians the freedom to binge their data usage without incurring expensive overage fees,” said Paul McAleese, President, Wireless, Shaw Communications, in a statement to iPhone in Canada. “Canadians are watching more video content, streaming more music, and using more data on their mobile devices every day. Our Big Binge Bonus gives Freedom Mobile customers the data they need, free of charge, so they can enjoy unrestrained access to their favourite content,” explained McAleese. Freedom Mobile’s Big Binge bonus data is available today for new and existing customers. To get your 100 GB LTE bonus you need to sign up for a Big Gig plan starting at $60 per month with a new smartphone on a two-year term (iPhone XR, iPhone XS and iPhone XS Max are eligible with $60 per month plans plus MyTab Boost monthly charges ranging from $30-$40). The Big Binge Bonus data is applied automatically to your account and never expires, as long as customers remain on their eligible rate plan. Freedom Mobile has recently rolled out its Extended Range LTE network, offering increased cellular reception in hard to reach areas and outdoor coverage, to go with VoLTE for select smartphones, including Apple’s iPhones. If you are getting decent network coverage from Freedom Mobile in your area, this deal appears to be a no-brainer, given how expensive data overages are from the ‘Big 3’, at $100 per gigabyte. Shaw is upping the ante big time with this wild offer from Freedom Mobile–it’ll be interesting to see how Rogers, Telus and Bell will respond.